There is a prominent perception of the "American Dream" that permeates throughout society today. One aspect of this idea is the "self made man"; someone who comes from little to nothing, and rises above adversity to become a successful citizen. America has had a slew of self-made men, many even becoming criminals such as Al Capone. But the case of General James Gavin is completely unique, a man who stayed on the side of the law and emerged through poverty to become one of America's most crucial and influential generals. Gavin's childhood was anything but luxurious. He was adopted by a family in the coal mining industry after his parents had died before he was two, and he had to work to support the family distributing newspapers, and working in a shoe store (Historical Markers General James M. Gavin). Determined to receive a better education, Gavin went to New York, joined the army, and got accepted into army prep school. But, despite the erratic nature of his beginnings, Gavin was a focused and determined person and he enlisted in the army at 17. 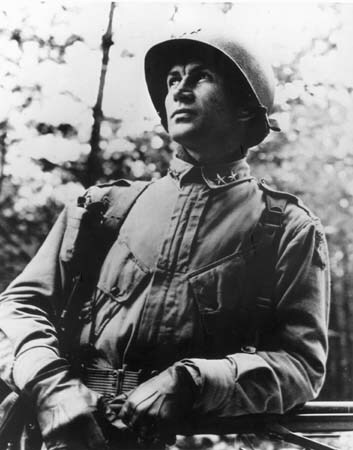 Shortly thereafter, he aspired to attend West Point and he enrolled in classes to complete his high school education, and ultimately got into West Point despite the competitive nature of their testing and admissions policies (The New York Times, "Lieut. Gen. James Gavin, 82, Dies; Champion and Critic of Military). It was the beginning of a long road, eventually leading to heroism for General Gavin. Gavin went on to become a paratrooper serving in both World War II, and the Korean War, he also aided the creation of helicopter forces which were common in the Vietnam War (The New York Times, "Lieut. Gen. James Gavin, 82, Dies; Champion and Critic of Military). Aside from his military decorations which are the catalyst for much of his success, Gavin also managed to write several books detailing the war, his beliefs regarding Vietnam, and one book a compilation of letters to his daughter, sent while in service ("Historical Markers General James M. Gavin."). Being an avid reader, General Gavin found writing to be a succesful method to get his ideas across. His eloquence and intelligence is stunning considering his background as a child, and those traits are another major factor in his acclaim. However, possibly even more impressive than Gavin's knack for literature, is his outspokenness. On several occasions throughout his career, Gavin spoke out against policies he found to be ineffective or corrupt, unconcerned with the status of whoever he was arguing. In some of his more famous dealings, he protested the excessive mention of nuclear weapons instead of armed forces, the war in Vietnam, and he even denied a promotion to a four-star rank because he disagreed with the Pentagon system (The New York Times, "Lieut. Gen. James Gavin, 82, Dies; Champion and Critic of Military"). Another instance was his disproval of Eisenhower's reliance on nuclear weapons. Gavin emphasized the importance of the armed forces, instead of relying on mssively destructive weaponry ("Historical Markers General James M. Gavin". Because of his complete faithfulness to morality, but emphasis on hard work, Gavin represents he role model that Americans look for; The kind of self made man who is able to succeed vigorously, but still maintain his ethics, be outspoken, and promote his beliefs. Because of the confluence of traits General Gavin had, he was able to go from two ends of the societal spectrum. In one lifetime he was able to go from the bowels of a coal mine to nation wide acclaim and respect, and for that he is a true American hero. Fowler Glenn, "Lieut. Gen. James Gavin, 82, Dies; Champion and Critic of Military", the New York Times, New York, NY February 25, 1990. This is General James Gavin's obituary written in the New York Times. This source was helpful because not only did it give a breakdown of his vast accomplishments throughout his lifetime, but it also provided the names of books, and memoirs related to his experiences as a General, and a political activist. Also, the obituary mentioned when and where his services would be held, which is historically interesting. Finally, this piece aided the writing of this essay because it briefly mentioned several fields of successes in his life without going into meticulous detail as some articles and books do. This is a website on General James Gavin, which was similar to the obituary in the sense tat they both gave accounts of his life accomplishments. However, this site stood out because it gave more detail on certain aspects of General Gavin's life that the obituary ran through. Also since the site is completely dedicated to history in Pennsylvania it shed more light on his upbringing in the coal mining business. 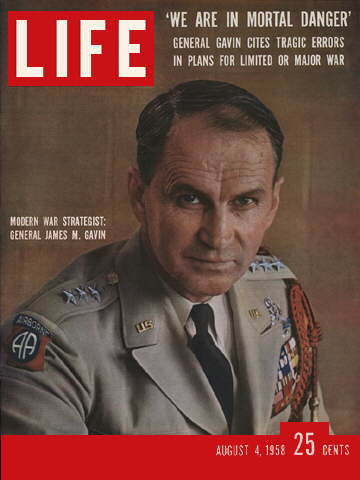 For more photos of General Gavin taken by the Life Magazine team, look at this website.